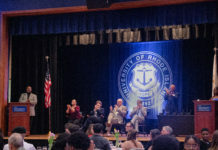 The University of Rhode Island will be offering more inclusive housing options next year due to the efforts of the Gender and Sexuality Center and Housing and Residential Life. Improvements to campus housing options have been in the works for a number of years, according to Gender and Sexuality Center Director Annie Russell, but the push really began this past summer. “At the end of last year I worked with the president of the LGBTQ Commission to bring forward that these changes that were not coming forward as quickly as we would want them to,” Russell said. Part of the motivation behind this push came from the University’s low national ranking for LGBTQ inclusion in campus housing. The Campus Pride Index helps set national standards of LGBTQ-friendly policies, practices and programs for universities all over the country. Although the university has excelled in all other fields of inclusion across campus, housing has consistently received one out of five stars, according to Russell. This year will mark the launch of LGBTQ Friendly Roommate Matching System, which will help pair members of the LGBTQ community and allies. As of now, Russell said there are roughly 70 students who already registered to take part in the matching service. “Fortunately, every single person was able to find the roommates that they were seeking and that was very positive for the upperclassmen students this year,” Russell said. This matching service differs from some of the university’s past matching efforts in that students are able to view their potential matches, according to HRL Coordinator or Educational Programs Deb Bergner. Instead of connecting with potential roommates on Facebook pages, they will be connected with students of similar interests and lifestyle habits. Junior nursing major Rachel Horrocks, who works for Housing and Residential Life, has been a leading force in helping to create these new changes on the housing application. Many of the new features within the application are thanks to the code Horrocks wrote herself. The application not only informs students of their options, but it also includes textbox description of different aspects of the LGBTQ community, such as gender identity. Instead of only providing the option of male or female, the application now lists seven gender identities to choose from, as well as an option to self identify. In additions to improvements to the housing application, Bergner is also working to assure that everyone who works in housing is receiving Safe Zone training – especially those who come into contact with students every day, like the housekeeping staff. One of the most significant improvements in housing for LGBTQ inclusion will be the launch of gender inclusive housing in the fall of 2018. “Gender inclusive housing allows students to live with whomever they choose, regardless of their gender identity or expression,” Bergner said. Russell and Bergner have been working to launch gender inclusive housing in every residence hall on campus. Both feel strongly that students should not be limited in their options. “If you want gender inclusive housing you don’t also have to give up your LLC,” Bergner said. This is especially important to incoming freshman who are automatically placed with their Living Learning Community. Gender inclusive housing was originally meant to launch this coming fall, but complications and uncertainties of the new program have resulted in it being put off for another year. One of the issues is that the university has no way of knowing how popular the program will be. Other issues include potential criticisms. Russell said she is disappointed about the delay and that criticisms should not be a determining factor of the programs implementation. “I don’t think that just because something like this may receive negative feedback from people who are potentially bias, or frankly hateful, that it’s something we should slow on or move down on,” Russell said. “I think that it’s important that the University recognize that certain things that will advance the student living experience on campus should not be subject to universal societal approval,” Russell said.